SEAT INSERT KITS: Our do-it-yourself seat insert kits are the easiest DIY kits on the market. They contain everything you need to make a professional seat insert. Add tape or a covering kit to meet regulations of various sanctioning bodies and to improve the look and durability of your insert. We can custom make a kit of any size. HEAD SUPPORTS: Our head supports are fitted for you and your vehicle at affordable prices. Our SFI 45.2 certified NHRA Accepted Supports with Carbon Fiber or Aluminum backings are constructed using the industry leading EIS W50 foams and are covered with premium Carbon X. We offer supports in 1/2" increments, starting at 1.5” thick, for optimal fit and performance. You can expect fast service & quick turnarounds when you order from us. INSTALLATION SERVICES: Leave the work to us! We can come and fit you in your vehicle. Get a completed seat insert in 24 hours or less. Please call for pricing and schedule availability. Discounts are offered for multiple builds at the same time. 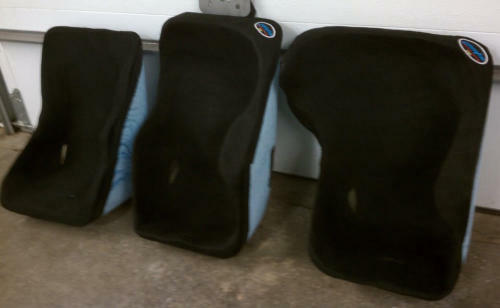 RECOVERING: We can cover or re-cover your seat insert or head pads. For pricing and scheduling please call us at 386-788-8963.